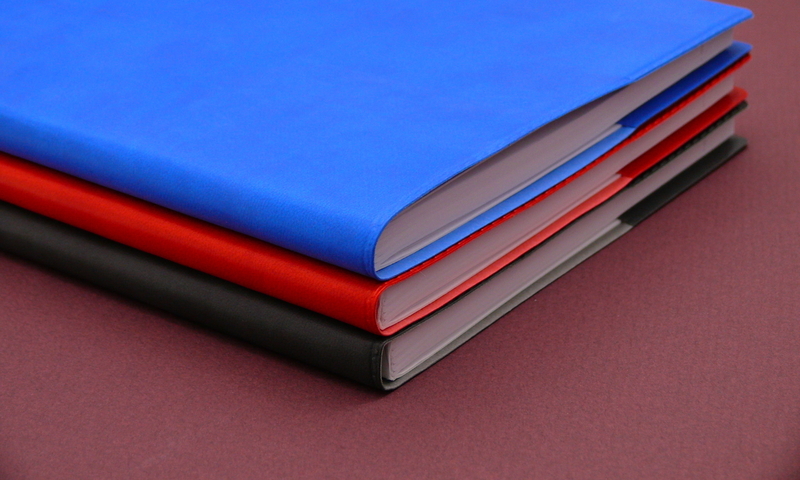 Leuchtturm1917 has a collection of slim, light-weight notebooks called Jottbooks. 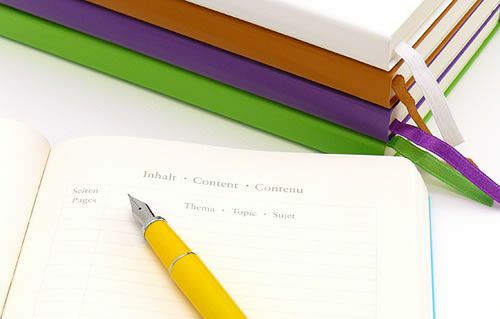 They fit the definition of a cahier according to Google – an exercise book or notebook – except they do not have the visible stitching on the spine that Americans often think of when they hear the word cahier. The Jottbook is a little different than the typical cahier notebook because it is paginated. In other words, there are 60 numbered pages and a blank index in the front that can be filled in to help you find the contents in your journal later. In the lined Jottbook, each numbered page has rules that go to the edge of the page and they are narrow ruled – about 6mm apart. The color of the lines is a subtle light grey that serves as a light guideline and doesn’t interfere much with the appearance of your writing. The pages have a little extra space at the top where the date can be written if you need it. The Leuchtturm1917 Jottbook is thread-bound which allows the notebook to be opened flat and prevents pages from falling out. If you need to remove a page, 32 of the pages are perforated and can be cleanly removed from the Jottbook. 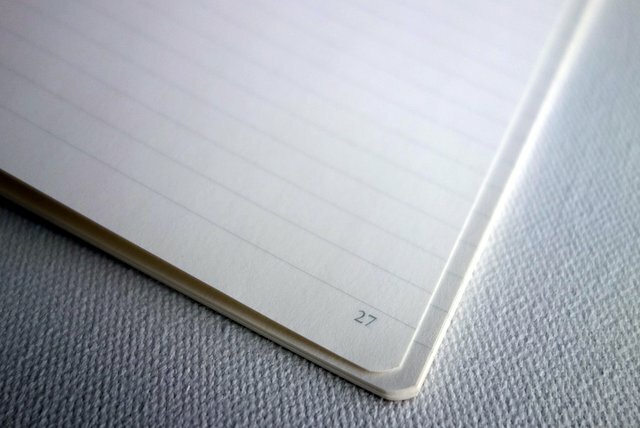 The cover of the Jottbook is made from a flexible laminated stock that has a slight texture and it is plain except for the brand name Leuchtturm1917 embossed on the bottom of the back cover. The corners are rounded and inside the front cover there are spaces for your name and address. There are also a couple of stickers included with the notebook – one blank and one lined – in case you would like to label it. 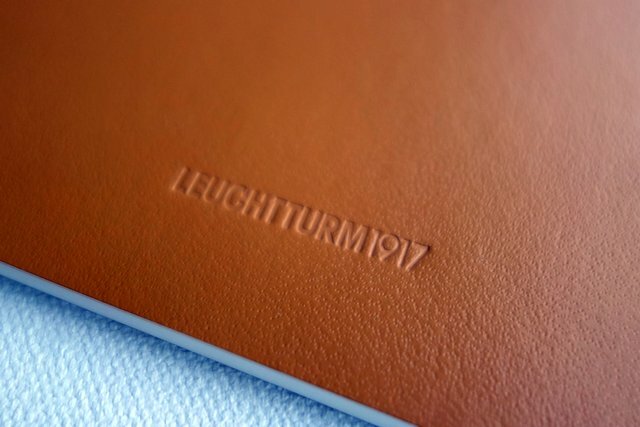 From the Leuchtturm1917 website: current cover colors include black, white, caramel, red, pink, lavender, lime, turquoise, cornflower, navy, tobacco and taupe. Sizes include A4 (210 x 297 mm), pocket size 3 5/8″ x 5 7/8″ (90 x 150 mm) and large 5 5/8″ x 8 1/8″ (145 x 210 mm). Paper is available as ruled, squared or plain. 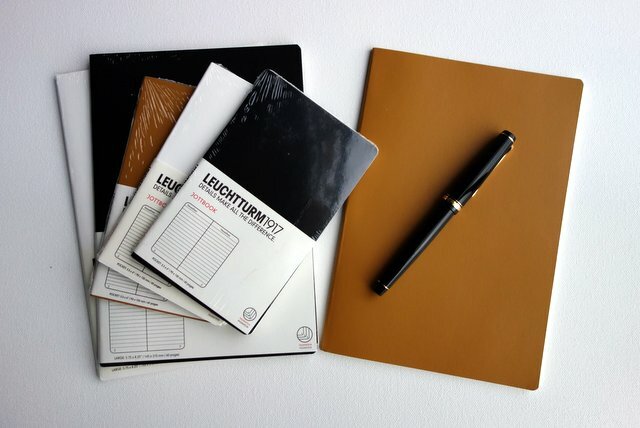 Writer’s Bloc has both the lined pocket size and large Leuchtturm1917 Jottbooks available in sets of 3 earth cover colors which include one black, one white and one caramel. 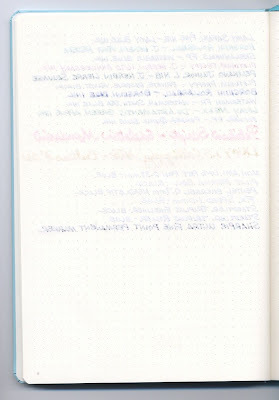 We’ve used Writersblok Bamboo notebooks and Moleskine cahiers in the past, and we are currently enjoying the Jottbook. 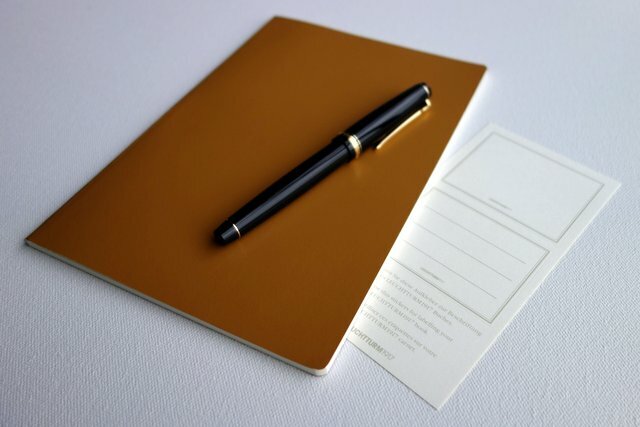 What is your favorite cahier notebook? The Leuchtturm1917 Large 18 Month Weekly Planner has a practical multipurpose design. The 2012 planner begins with September 1, 2011 and runs all the way through the end of February 2013. This allows it to be used as either an academic planner or a yearly planner. 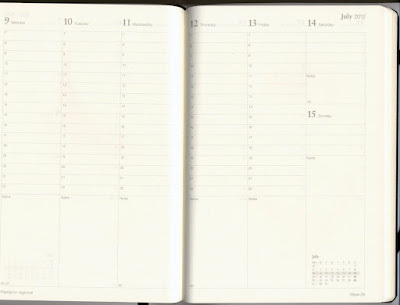 If you happen to lose your yearly planner before the year is over, the Leuchtturm1917 18 month planner steps in with plans starting in September to help you out. If you procrastinate and put off buying a 2013 planner until the new year has already begun, it gives you some breathing room until you can find a new planner. Its basic design is similar to a lot of other black-cover notebooks. The black cover is lightly grained to give it a leather-like appearance and the only writing on the cover is a small “Leuchtturm1917” on the bottom of the back cover. It has rounded corners, is held closed with a black elastic and has a matching black ribbon book marker. Inside the front cover there is a place to write your name and address and a handy expandable pocket is found inside the back cover. The cream color of the end sheets matches the cream color of the paper. It is about 5.75” x 8.25” in size and about 0.5” thick. I appreciate the fact that the hard-cover is very slim to make this planner as compact as possible. When you open this Leuchtturm1917 planner you discover that it has a stitched binding which helps it to open flat and keeps pages from falling out. The ink-proof, acid-free paper is cream colored and has gray printing. 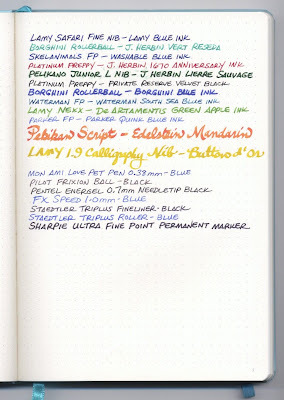 It is most likely 80g like the paper in many other Leuchtturm1917 notebooks. 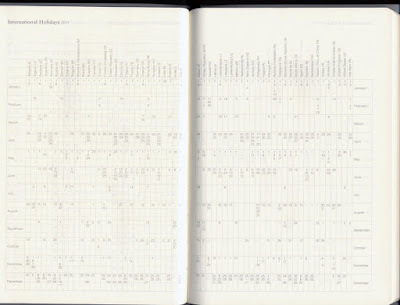 The first printed information is three pages of yearly calendars: 2011, 2012 and 2013. These calendars list the week number for every week of each year. Following these calendars is a six page monthly plan that runs from September 2011 to February 2013. This monthly plan shows you the phases of the moon in case you need to know that information. Next comes six pages listing three years worth of international holidays in close to 60 countries. This comes in handy if you are a business traveller or are planning a fun international vacation. The Project Plan spans two pages and covers September 2011 to February 2013. It has 29 lines worth of projects to plan. Each weekly plan is two pages, begins with Monday on the left and ends with Saturday/Sunday on the right. Each day gets a column of hourly planning from 07:00 to 22:00 hours with a space for notes at the bottom, except for Saturday and Sunday which are combined into one column on the right. Saturday has four unmarked lines for plans plus notes and Sunday has three lines plus notes. 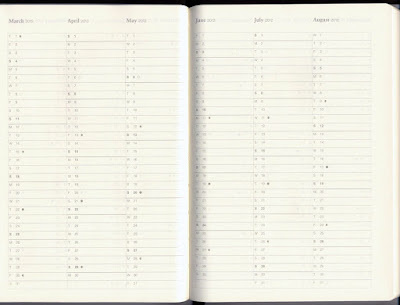 At the bottom of the notes space for each day are country codes indicating which days are holidays in which countries. The bottom right corner of each weekly plan has a calendar of the current month with the current week highlighted. The bottom right corner also includes the week number of the current week. The back of the planner has 15 blank pages for taking notes. If you can’t write in a straight line there is a lined/graph template included that can be placed behind these pages as a guide while you’re writing. 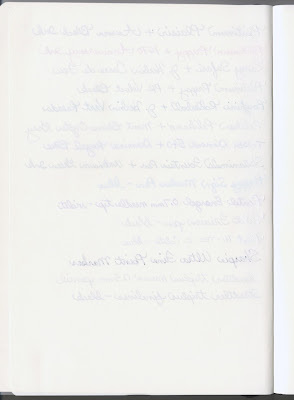 The Leuchtturm1917 website says that these pages are perforated so they can be removed, but honestly I cannot see any perforations here. If you like to archive your planners, the Leuchtturm1917 18 month planner includes handy stickers for labeling the cover: three stickers for the front cover and three stickers for the spine. 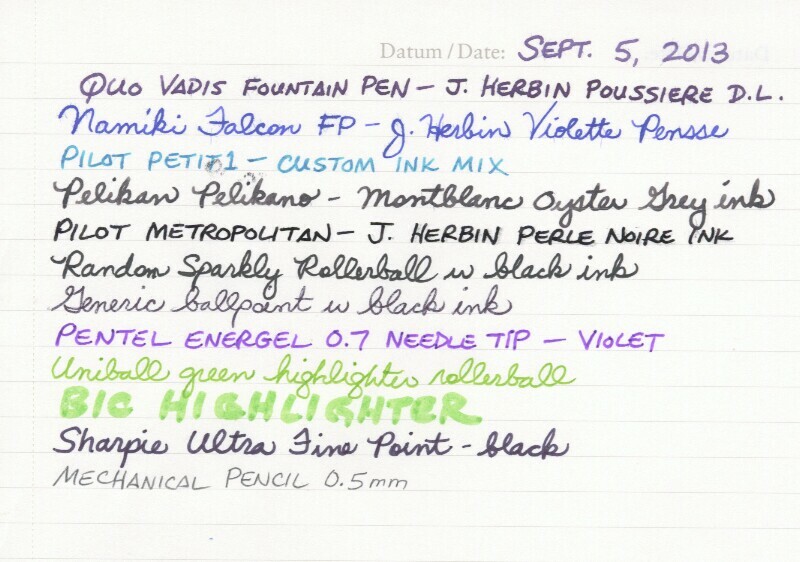 The paper seems to perform quite well with a variety of writing instruments including fountain pens. Very little bleed through or feathering of ink, however, there is some show through since the paper is 80g. I personally find I can use both sides of the page without it bothering me, but if you are very particular it could be bothersome. I especially appreciate that ink dries reasonably quickly on this paper so I can write without a bunch of smearing (I’m a lefty). 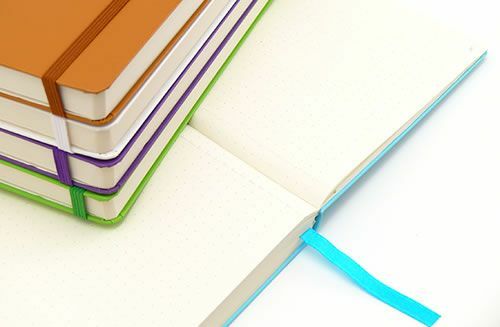 If you like to have a pen holder, Leuchtturm1917 makes self-adhesive pen loops in 6 different colors that can easily be added to your planner. 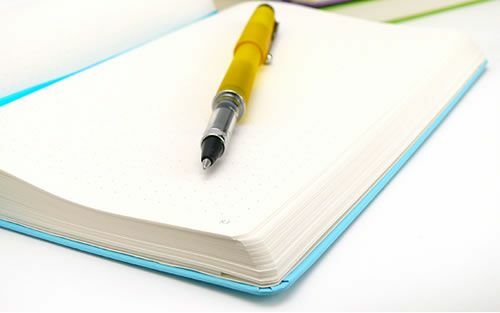 Leuchtturm1917 makes a variety of quality notebooks and planners where “details make all the difference.” What’s your favorite Leuchtturm1917 product? Many people consider paper to be fountain pen friendly if it has the ability to prevent the following three problems: ink feathering, ink bleed through and show through of your writing (so that you can clearly write on both sides of the page). I must also mention that the Quo Vadis Exaplan #66 21-month planner has 85g white paper. This paper likely performs almost as well as the standard 90g Clairefontaine paper. As as lefty over-writer, my own personal requirements for fountain pen friendly paper are a bit different. In addition to the three requirements mentioned in the first paragraph, the ink must also dry fairly quickly on the paper to avoid smearing or I end up not wanting to use it. I compensate for this partly by choosing ink that dries reasonably quickly, but I am willing to compromise somewhat on the bleed-through, feathering and show-through issues to speed up the ink drying time. I do well with the ink-proof paper inside Leuchtturm1917 planners. I believe this paper is typically 80g, so there is more show-through compared to a 90g paper. This issue may bother you, however to my liking, ink seems to dry more quickly on Leuchtturm1917 paper than it does on Clairefontaine paper. While they are still in stock many of these planners with a variety of different covers can be found at Writer’s Bloc. If you see something you want and we don’t have it please feel free to ask if we can special order it. Planner season is upon us (what happened to summer?) 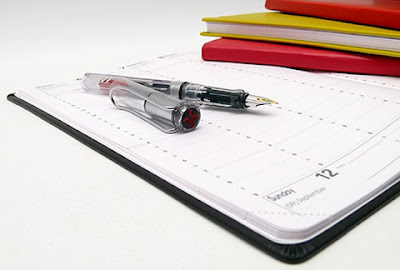 – get your fountain pen friendly planner now before they’re gone! 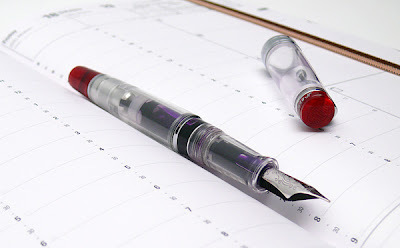 What’s your favorite fountain pen friendly planner? 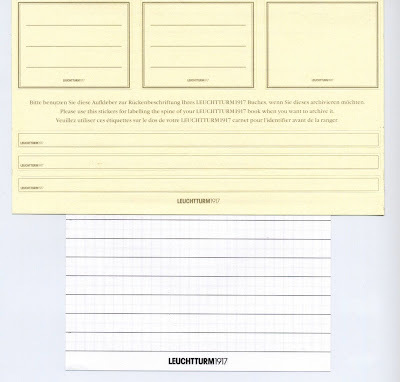 Leuchtturm is based in Germany and has been producing quality stationery products since 1917. This family-run company has the motto “details make all the difference.” Let’s see what details the LEUCHTTURM1917 medium dot grid notebook includes. The first thing I noticed about this notebook that distinguishes it from many other similar notebooks is that the pages are numbered, 1 through 249. To make it easy to find your notes there 3 pages in the front with a blank table of contents that includes a column to jot down the page number and another column to make a note of the “topic”. This is a really handy feature to have if you need to refer to specific things in your notes in the future after you’ve forgotten where everything is. The binding of the LEUCHTTURM1917 dot grid notebook is thread-bound, which means that it will open flat and the pages will not fall out. If you need to tear out a page, there are 8 perforated sheets in the back that can easily be removed. The slim hard cover is made with a synthetic, very lightly textured material that comes in five colors: Lilac, Lime, Caramel, Pure White and Turquoise. The cover is plain except for a small embossed “LEUCHTTURM1917” on the bottom of the back cover. An elastic attached to the back cover wraps around the front cover to keep your journal closed. Inside the back cover there is an expandable pocket for keeping notes, receipts, programs etc. Inside the front cover is a space for writing your name and address. The LEUCHTTURM1917 dot grid notebook includes some labels for the cover so that you can identify the contents of your notebook. There are three labels for the spine (approx. 3/8” x 7 1/2” each), two ruled labels and one blank label for the front cover (approx. 1 7/8” x 2 3/8” each). There is a matching ribbon bookmark to help you find your place. 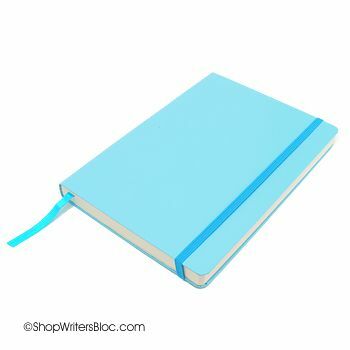 The size of the medium notebook is approximately 5 3/4” x 8 1/4” and it is about 3/4” thick. 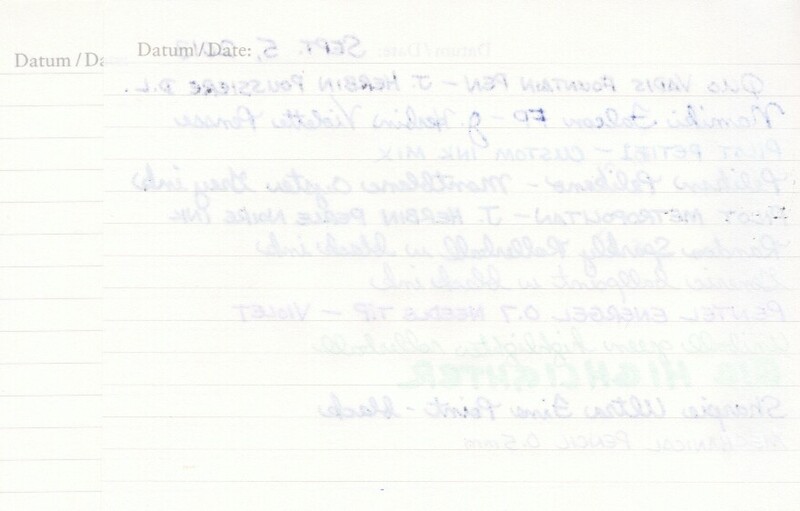 The paper is ivory color with a light grey 5mm x 5mm dot grid pattern that doesn’t quite go to the edge of the page. It is acid-free, 80g and is called “ink-proof paper” that can be used with your fountain pen. I tested it with several fountain pens and found it has better quality paper than the LEUCHTTURM1917 notebooks of a few years ago, but it is not as good as Clairefontaine or Rhodia paper for use with fountain pens. There was a little bit of feathering, a little bit of bleed through, but mostly the problem was with show through on the back side of the page. 80g paper makes it possible to have 249 pages in a nice compact size, but it might be better to have fewer pages and thicker paper. I was able to use both sides of the page as long as I carefully selected the ink color and nib size that I used. This journal is probably not the best choice if you want to write on both sides of the page with a fountain pen. 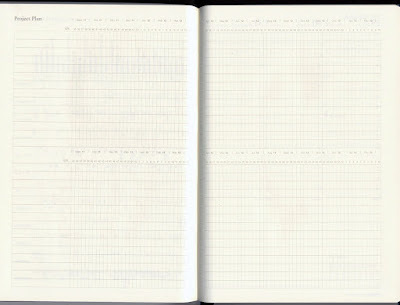 However, there are plenty of other features to like about the LEUCHTTURM1917 dot grid notebook! 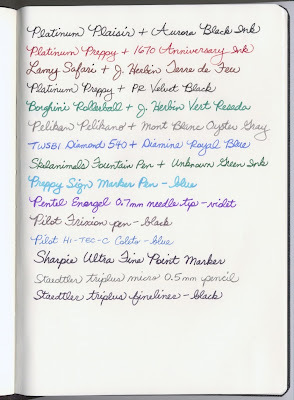 What is your favorite LEUCHTTURM1917 stationery? NOTE: Since this article was published, Leuchtturm has discontinued the turquoise cover on the dot grid notebook but is still making it with black and many other color covers.